McKENNEY -Wa-Baun-See, a Pottawatomie Chief. McKENNEY, Thomas Loraine / James HALL. - Wa-Baun-See, a Pottawatomie Chief. Wa-Baun-See, a Pottawatomie Chief. - McKENNEY, Thomas Loraine / James HALL. Title : Wa-Baun-See, a Pottawatomie Chief..
Map maker : McKENNEY, Thomas Loraine / James HALL.. Date : Philadelphia, circa 1836-1842. Size : 20.9 x 14.2 inches. / 53.0 x 36.0 cm. 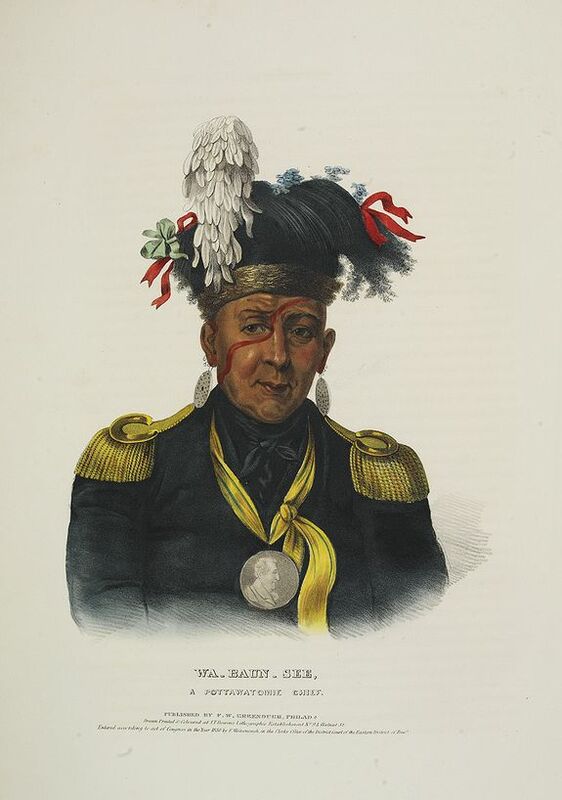 Description :A beautifully defined lithograph of Wa-Baun-See, a Pottawatomie Chief from McKenney & Hall's History of the Indian Tribes, perhaps the most important work ever published on North American Indians. Published by F.W.Greenough, Philadelphia and printed on the original full folio sheet and depicting a feathered headdress adorned, gentle portrait of the chief with a peace medal fastened around his neck. Thomas Lorraine McKenney was Superintendent of Indian Affairs under presidents Madison, Monroe, John Quincy Adams, and Jackson. As a result of his keen interest in the customs and beliefs of the Indian tribes under his jurisdiction, he commissioned Charles Bird King and several other artists to paint the portraits of Indians whom he had met or had heard about. With the help of James Hall, a frontier lawyer, judge, newspaper editor, and author, McKenney assembled the portraits into a coherent representation of Indian life, lore, and costume. Published as a three-volume portfolio between 1836 and 1842, the hand-coloured lithographs after the paintings are among the only portraits remaining of this early generation of Indian warriors, statesmen, medicine men, and commoners. The original paintings, which were on display in the Smithsonian Institution, were destroyed by fine in 1865.